After an opening narration sets up “Christmas Eve in New York,” we meet Nick Bianco (Victor Mature), an ex-con who tried to go straight. Employers didn’t take well to his criminal record, so in order to give his two daughters a decent Christmas, he knocks over a jewelry store inside the Chrysler Building. Him and his cohorts pull off the heist, but at the last minute, an alarm is triggered and Nick winds up with a bullet in his leg and cuffs on his wrists. This opening was shot entirely on location in the Chrysler Building, including the elevator and jewelry store. It adds a huge amount of realism to the heist, particularly when Nick and his boys are stuffed into the elevator, sweating out their escape. It’s clear the crew didn’t have much space to work with in the jewelry store/elevator – everything was shot really tight. In the elevator, the camera is shoved right in Nick’s face. It makes for an anxious viewing experience. Assistant D.A. D’Angelo (Brian Donlevy) recognizes that Nick is a family man, so he lays the guilt trip on him about how his daughters will have to grow up without a father. But, if Nick squawks on his cohorts, the D.A. promises him an early release. Nick’s a family man, sure, but he’s old school. He decides to keep his mouth shut and do his bid like a man. Three years go by, and Nick’s wife stops writing him. He comes to learn that she shoved her head in a gas oven out of grief, which convinces Nick to snitch so he can be with his daughters. In prison he’s visited by his daughters’ former nanny, Nettie (Coleen Gray). Nick and Nettie have a romantic connection right away. Their relationship provides heavy doses of melodrama later on. 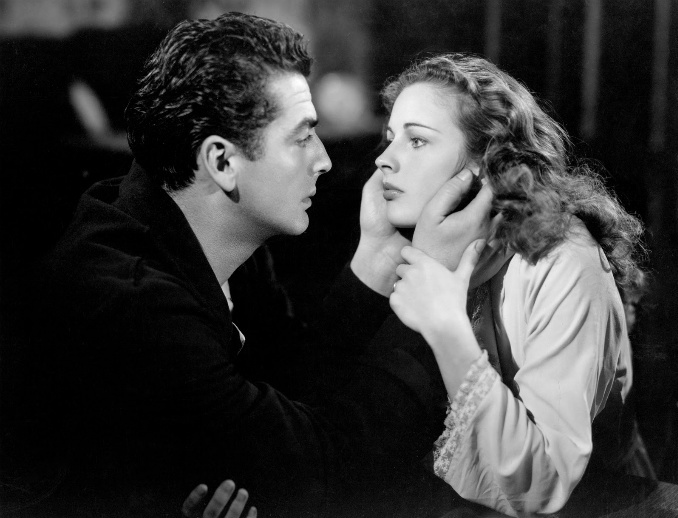 Victor Mature is believable as a crook with a heart of gold. He looks like a slick Italian hood, but he underplays much of the drama and sappiness so he never feels like a caricature. Nick’s a sympathetic character and Mature delivered just the right amount of toughness and compassion. I felt for the guy, y ‘know? Before he can be released, Nick shares a cell with Tommy Udo (Widmark), a gleefully sadistic gangster who’s in for cutting the ears off a man’s head. Or, as he puts it, “traffic ticket stuff.” It’s an astoundingly psychotic performance – heightened to a great degree by Widmark’s signature cackle, which was apparently his real laugh. Udo’s streak of violence in the film peaks when he shows what he “does to squealers” by wrapping an electrical cord around an elderly woman in a wheelchair and shoving her down a flight of stairs. Even when he’s not killing old ladies, he chews every scene he’s in with an impressive force. His performance is comparable to Heath Ledger’s Joker. It’s scary good. It’s an unforgettably wicked performance that put Widmark on the map. In real life he was a pacifist who loathed violence and guns. In 1950’s Panic in the Streets, he finally got to play the good guy. Nick is forced to get close to Udo so he can keep dishing dirt to D’Angelo. Once they have enough evidence to go to trial, Udo is finally sent before a jury. Everything seems perfect for Nick – he’s back with his daughters and is embracing his new relationship with Nettie. Then, somehow, Udo is acquitted. He’s back on the streets, which means Nick has a fatal target on his back. In order to protect his kids and new lady friend, he’s forced into a showdown with Udo. The climax is tense as hell, with Udo and Nick each trying to outmaneuver the other without breaking parole. The on location shooting and stripped-down style give Kiss of Death a strong sense of realism. This is offset by Widmark’s cartoon-like sociopathy, but it works. The combination of melodrama and criminal thrills also works, both serving to further cement the noir themes of doom, hopelessness, and anxiety. Hathaway continued to explore social realism in hi next film, Call Northside 777 (1948). 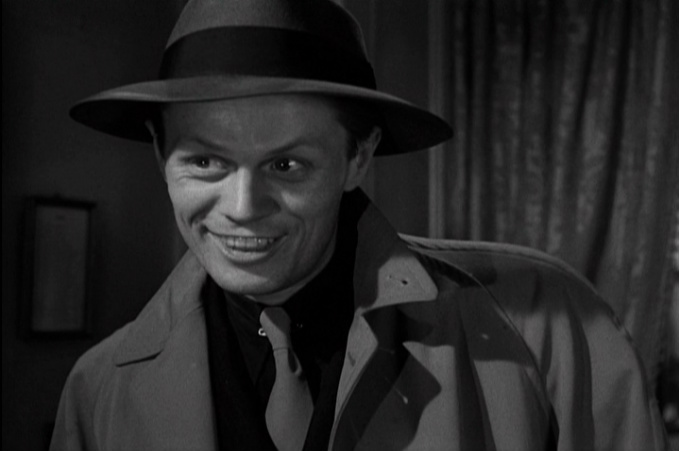 Kiss of Death is a great film and I dare anyone to not be completely mesmerized by Richard Widmark as sociopath Tommy Udo. Pushing old ladies in wheelchairs down flights of stairs.